There is no doubt that vocals can be one of the most challenging parts of a project to mix. 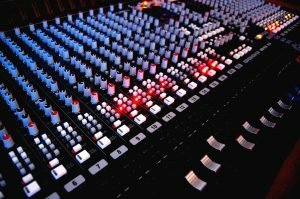 With problems such as varying dynamics, sibilance, pops, rumble and poor mic technique to tackle, it’s no surprise some mixes come undone due to below-par vocal production. The trick is to tackle these issues with dedicated processors early on in the mixing stage. In fact, it’s a good idea to get stuck-in as soon as you have the vocal recording. Simple processes like de-essing, filtering low frequencies and compression will pay dividends when it comes to placing your vocal in the mix. At this point, don’t bounce the vocal down and keep any plug-ins or processors running ‘live’, as it’s very likely you will want to change them later. Although modern DAWs have a massive amount of head-room and bandwidth it’s still good working practice to avoid huge overloads across your mix and on the master output. This will ensure dynamics and frequency response are preserved and files are in a good state to be transferred to third parties for purposes such as mastering and remixing. Remaining disciplined from the start of the mixing process will help. To use an analogy, picture an acoustic band playing on stage and think about the positioning of the musicians. One guitarist may be to the left while another stands off to one side. The vocals can sit left of center, whilst backing vocals can come from extreme left and right. There are no hard and fast rules here, but try to mix things up a little so an interesting and engaging result is achieved. When you’re finished, remember to check your mix in mono for good translation to other playback systems. The most basic but most important tip is this: don’t over complicate things. In reality, the mixing process starts as soon as you lay down your first instrument. As things are constructed try to make careful and attentive decisions about which elements you are going to use together. When it comes to mastering, a solid mix of four or five well-chosen and treated instruments will have much more impact than 30 different sounds fighting for space. If your mix doesn’t sound good with a few instruments playing, it’s unlikely it will sound any better if you layer another ten on there! In most cases, less really is more.